Impossible to cancel the subscription. What happened to this station? I love it and I can’t get it anymore. Why did you take it off? I listen to all my nephews football games played in other cities on Zfriday nights! Thank ou!! Won’t play any stations and doesn’t give any feedback why it won’t play anything. TuneIn es una excelente herramienta para escuchar mis emisoras de radio locales. Es superior a otras que se desconectan con frecuencia y te inundan con promociones de programas que no nos interesan a muchos. ¡TuneIn es excelente, son los mejores! ridiculous app. Crashes if you try to pay. Crashes if you try to stream audio in car via carplay or sport stations. And you buy reviews? Seriously? That low? Lol Happy shutting down! I have had this app for years. Now it keeps saying unexpected error for days now. I guess it’s time to delete app. Pro: nice to have local radio streaming via phone and internet. Con: multiple times in a single broadcast the feed will spontaneously jump back from between 30 seconds to two minutes without the ability to jump forward again. Buffering problems? Probably. Thrilled to be able to listen to my cousin DJ on a country station not in my listening area. Tried this on a free trial - thankfully. Listening to a football game driving down highway. Buffering was horrendous. Kept repeating itself over and over about drove me crazy. Had cell service throughout the game. Finally shut it off when I found the game on the radio. Then tried it when stationary. Seemed ok. Not a fan. I can Sirius for about the same and it works. Careful with this app or you WILL be charged over $106!!!! Keeps getting in repetitive loop so you hear the same sentence a million times. Throw this back. Are U f’ing kidding me???? I listened to an entire NFL game. A huge comeback in the works. The final kick in overtime. Announcer says “the kick is up and it’s...” then the broadcast shuts off and it keeps repeating “stay tuned until your broadcast resumes” It never resumes. F. You! I signed up for a free trial to listen to an NFL game. It took half an hour of waiting and waiting and reloading and searching for another station before it would work. I understand there might be a few seconds buffering but it was not working at all. Had about 4 or 5 seconds of audio before it cut out. Of course it’s a free one week trial, and thus they make it super impossible to find a link or a way to cancel. Thought this was too good to be true, and despite my better instincts, I tried it anyway. Fail. Don’t do Tunein, it’s better to tune out. Love this app and use it nearly every day. I recently got Apple TV, and would love to see a version of Tune In for that, so I can listen through my TV. Wish there was a way to decipher which episodes have been listened to similar to the Podcast App. I have over 30 podcasts I listen to and it can be difficult to find which one played last after listening in the car. You’re several minutes behind the espn app! I downloaded this to listen ‘live’...if you can keep up with the slow refresh on espn it’s not worth it! They block the local radio station so I can’t listen to my local NFL game. But when I turn the radio on the game plays. All million ads and all. So Tune In wants to charge me for commercial radio? I think not. It’s pretty pathetic how the times are these days when you have to pay for commercial radio. I’m not sure which ones being pathetic the NFL or tune in but I certainly won’t pay for commercial radio. Free trial automatically signs you up for $100 a year subscription. TuneIn took $107 out of my account. It was supposed to be a monthly subscription. I never saw that option anywhere. Besides that, it's a simple radio app. There is no way it's worth that kind of money. HBO is less than that. Apple, please take the crooks off the app store. I did a one week trial to try this app out - it buffered constantly, cutting in and out, and I was very disappointed. I did not realize it would auto charge me $99 after the week was over - I can not find any way to contact the app developer, other than in this manner. I would appreciate a refund and someone to contact me ASAP. When you open the Tunein app for the first time it automatically signs you up for a $99 year long subscription without warning you. It also doesnt allow for you to cancel this subscription on your phone so you have to go on your computer and cancel it through apple. This app should pulled from the app store. I downloaded it to test a radio channel and just got charged with $99.99 after few weeks. Sneaky way to charge you. Don’t use this app. They’ll charge you $100 without you even knowing or consenting to it. Might give you the radio station you want but I highly recommend looking for a different app or source. I spent $100 on the year long package so I could listen to the Brewers since I live in WA. It skips constantly and today, 9/29 is one of the most important games of the season and they are saying the game is over and won't let me listen. It's still the fifth inning and the game is incredible close, still I can't listen. WORST $100 I HAVE EVER SPENT, DO NOT GET THIS APP. I am fortunate enough to remember when AM Radio ruled and the transition was made to FM dominance. Tune in is a tech tool that opens today’s game up much much wider. Radio Worldwide!!! Their 7 and 30 day "free" trials are a total scam. It is very complicated and difficult to actually cancel once they get you into their system with a credit card to charge. It is very hard to not get charged for a $99 annual subscription that is definitely NOT worth the money!!! This is a very poorly designed app that does not even offer the stations I wanted most. TuneIn is fraudulent and should be criminally prosecuted. They are not worthy of the 1 star. Should be zero stars!!! I’m not very tech savvy. But I found The Tune In app very easy to navigate. For sport and music. Thanks for a great addition to my iPhone. Necesito información sobre el Por qué ya no me deja sintonizar estaciones de otros países. He tratado de abrir la aplicación para escuchar radio de otros países pero parece que ya no quiere acceder. Solamente locales. Les agradecería mucho se me dan indicaciones sobre cómo solucionar ese problema. I’ve used the app for some time while traveling and found the occasional commercials tolerable. But now it’s nonstop, even cutting into the middle of songs so I’m switching. Can no longer recommend this app. I have been trying to get myself removed from this overrated and overpriced app. PLEASE REMOVE ME!!! This used to be my number one go to music player app. Out of the blue, (no updates, no downloads, no nothing), whenever I launch a station now, the app crashes. Go figure. Goodbye TuneIn radio. Hello Pandora. UPDATE JUNE 2018: Still using v11 on my phone. V14 doesn't let you see the remaining time on the sleep timer like v11 does. Please bring that feature back. UPDATE AUGUST 2018: I'm bumping my rating back to 3 stars but still desire the countdown timer to show time remaining when sleep timer is set. V11 is still on my iPhone and still shows that. Come on coders, it can't be that hard to fix. We don't need to see the Zzzz's. UPDATE SEPTEMBER 2018: 14.7 released. Still have not addressed my biggest beef above about the number of minutes remaining on the sleep timer. Yep - I haven’t had a radio station not found as of yet. I downloaded it for the 7 day trial, and it told me I would be charged $9.99 a month after the trial. I logged in a few days later but could not find anywhere on the app to cancel my subscription. Right after I logged in, I got a charge for $99.99 for an annual subscription. I would have never done the 7 day trial if I would be charged for an annual subscription. I am now having to waste my Saturday night to try to resolve this issue. As a Dodgers fan in NY, the only way to keep up with the Boys in Blue is with Tunin!!! App will randomly repeat and get stuck in loop. Eventually you figure out you’ve heard the same sentence 4 times. Also, commercials randomly cut in over the top of talk radio, morning shows, etc. Radio stations never load. Always presented with an error occurred, please try again. I’ve deleted and reinstalled the app a couple times now and always the same result. Tune in radio is a great app and provides good quality listening no matter what the genre. It's hard to navigate, hard to understand, and hard to cancel. But very easy to sign up! Downloaded this app, never signed up for premium, currently don't even have it on my phone, but was charged $99 for a year subscription. No response from TuneIn on a refund. I downloaded the app to listen to a sports so then deleted it and cancelled the trial. It continued to withdraw money from my account and I couldn’t get anyone to pay attention to my requests. 😡 It finally stopped taking money and NOW it’s started back WITHOUT my authorization!!! I want my money back!!!!!!! This apps billing is directly and only through iTunes. Therefore, you won’t need a credit card to start the trial. But after the trial you will be billed by iTunes automatically for a full year. This used to be my number one go to music player app. Out of the blue, (no updates, no downloads, no nothing), whenever I launch a station now, the app crashes. Go figure. Goodbye TuneIn radio. Hello Pandora. UPDATE JUNE 2018: Still using v11 on my phone. V14 doesn't let you see the remaining time on the sleep timer like v11 does. Please bring that feature back. UPDATE AUGUST 2018: I'm bumping my rating back to 3 stars but still desire the countdown timer to show time remaining when sleep timer is set. V11 is still on my iPhone and still shows that. Come on coders, it can't be that hard to fix. We don't need to see the Zzzz's. UPDATE SEPTEMBER 2018: 14.7 released. Still have not addressed my biggest beef above. Was unable to listen in Europe during trial subscription was unable to cancel through the app. Would not recommend. I’ll listen to a radio station and 10 seconds in an ad will play. Then a little bit later same ad will play. Continuously repeats. I’ve had TuneIn for years. Have now deleted the app and went with another one. Informative and listening pleasure, THANK YOU!! Tune in radio is a fav! I stream all the time! It is great!!! Tune-in is my favorite music app. Very good app. There is a lot of different stations to choose from. I use it to put me asleep every night. Rip off - robe u in and make it impossible to cancel. Don’t do it! Can’t even get the games! You will be charged even if you think you canceled. Very unhappy had to call Apple to figure out how to cancel. Sneaky underhanded subscription plan. Beware. Didn’t realize I subscribed to this. Don’t remember ever agreeing to pay for it especially since Mlb at bat would be 75% cheaper for what I wanted. Explored a few other things though and didn’t work so well. If your into sports of all kinds this is for you. Not working since last update. Won't work after last update. Says "An error has occurred, please try again." Turned off Apple Radio. TuneIn is better. I use CarPlay. I listen to Bloomberg radio while driving. Apple Radio has Bloomberg Radio but every time I turned the truck off then back on, CarPlay defaulted back to Apple Music. Annoying as heck. Not so with TuneIn. CarPlay will stick to Bloomberg with TuneIn. I’m very happy to have TuneIn and CarPlay working together. I downloaded this app. The free trial must have expired. It automatically charged $99.99 to my credit card without my consent for the premium pkg. I would not have purchased this. I would not recommend and wish I could give zero stars. Many radio options on your mobile device. Excellent! To use this app, you have to pay $99 per year for a subscription. They give you a free 7 day trial that will automatically charge you $99 at the end of the trial. If you want to cancel before that, you have to Google it to figure out how to do it. It’s that hidden. Downloaded to listen to a NFL game and it was spotty reception. A week later I was blindly charged $99.99 for a yearly subscription. Luckily I got the charge reversed by Apple. Don’t not use this app. You immediately have to agree to a 7 day free subscription and if you don’t cancel in time they will charge you. If I New how good it would be I might get it but not agreeing to an automatic charge. Car Play does not work. It does not respond to "Recents" nor to "Favorites" selections. Horrible. Claimed would play radio stations but doesn’t. No place to cancel app so do they think they can just charge me for pretending to offer things they don’t. I had this app on my phone a few years ago but took it off because I didn’t use it. Two weeks ago I re-loaded this app back to my phone. There was nothing about a charge or anything like that mentioned but just a few days later I was build a $99.99 charge for a one year subscription totaling out to $107.99 after taxes. I immediately canceled my subscription to tune in radio and called Apple to try and get a refund but never could get through to their billing department because someone kept hanging up. Therefore I called my credit card company and dispute the charge and had it taken care of that way! Bottom line do not load this app because it will charge you! I listen to a lot of mlb games using the replay feature and tunin screws those up just as bad as the live broadcast. Less than $9 a month is the only reason I still use this app. Picked it up to hear my home town team after moving... the signal was dropped every couple minutes. By halftime I deleted Before you blame my wifi.. grandson had no problem... also i picked up a different app... listening to 2nd half. Not a single drop And they want a big buck for this?? This app remote doesn’t work on Mercedes and Kenwood head units! Make sure you start it before driving, or you will have to open the app while driving and that’s not a safe thing to do. Errors if you try to start it from your cars controls. I’ve long graduated and moved away but can still catch school hometown broadcasts of sports events and talk shows. Love it! So I downloaded this App from Apple Watch App store and it's not operating properly. I have Apple Watch Series three with GPS+Cellular. I want to use this app on my watch without my phone. But this App need the phone. They just charged me 99.99 dollars and I have no idea why. I have only used a handful of times. It is definitely not worth that much money. This radio works great! There seems to be less censorship than with other radio apps. However some old time radio shows are not intelligible. Correct that by adding a graphic equalizer and the app earns the fifth star. Don’t press the clock display; it locks out ALL controls! Fix this bug/“feature”, and it goes back to four stars. I uninstalled the free version, hoping to re-install it and restore control. I could not find it in the apphole store. So I got the subscription version. It has video pop-up ads that render the content inaccessible and probably burn my download limits. I can’t seem to find the “cancel your $99 subscription” button. I now rate this app as MALWARE! They charged me long before my trial ended. And of course there’s no option to get my money back. I never use my radio at home anymore. I can listen with my wireless headset. This was a great app and I don’t mind to listen to commercials from time to time, but I just listened to a radio now for like 10 mins and I heard Samsung Galaxy ad like every minute!!!!???? The price for no ads version is exorbitant, do you think you are Netflix or Prime (they are both cheaper, btw). It should be $9.99 yearly not monthly and you do know that most of radio stations has its own app that play just as nicely and with no ads? Makes you sign up for a $10/month subscription to listen to games on a 5 minute delay. Push notifications do a better job. Take that $10 and buy yourself an am/fm radio. Wack. I only downloaded this app because I needed to listen to my KSU Wildcats play their first game of the season that I was not able to go to and was not broadcast on TV. It “stuttered” all the time! Repeating the same second or two of audio. There is no reason for this. It should buffer the broadcast so short interruptions don’t affect the playback. I don’t care if it’s not live. I’d rather that than constantly here the stuttering. Very disappointed. I definitely will cancel this app when the game is over. If you like static and digital noise instead of your favorite team’s broadcast, this app is for you. Less than 1 star review. I really enjoy listening to WHUR on Sundays and WPFW on Saturdays. My two favorite stations. I didn’t give 5 stars because the stations repeat advertising something or the station doesn’t play after you open the app. I still love it overall though. Thank you! I want to cancel this .. will deleting the app delete this renewing policy ? I use the app to listen to my favorite local station. Since the latest update, it errors as soon as it gets past the logo. I can’t even search for anything. Update to get it working and I’ll change my rating and review. I can’t stop my subscription and they won’t stop taking money from me. This app does not allow you to easily deselect premium! Ustedes son unos estafadores! Me descargue la aplicación gratuita. En ningun momento me suscribi ni un carajo. Me cobraron $99.99 así porque si. Hay que ver que el internet está plagada de descarados como ustedes. Ya solicité reembolso a Apple. Radio ni radio. Pura basura es lo que es esto. $99 dolares por esta app de verdad que ustedes tienen la autoestima alta muchachones. Have been using app for several months with no issues. Now I’m getting an error message to try again. Nothing works. App appears broken. Broadcast often “rewinds” and replays segments. Nice listen to pod cast of my favorite talk show host and K-Love Christian radio. I love that I can listen to Brewer games wherever I’m at big fan. The only problem I have with this app is even if I have two out of my four bars of signal it buffers for ever I have to shut down the app and restart it, which wouldn’t be a problem if I could go right back in to an old game that I’m listening to and he would pick up where it left off instead of starting all over. This is also a problem because it takes so long for the games load since they are hours long so if it shuts down when I’m two hours into a game and I can only scan 30 seconds ahead this obviously takes way too long and then I end up getting so fed up because I’m trying to work while I’m listening to this day I cannot listen to the game anymore so I have to switch my app. Disappointed - use with caution!! I had an unexpected $100 charge for this app. I have no idea where it came from, I never would have signed up for it if I knew there was a charge and I barely use it. Kind of shady!!! A local sports bar recommended the app, and as you are installing the free download it prompts you to enter you ITunes pin, a week later I’m charged $106 for games I couldn’t even find on this terrible app. DO NOT WASTE YOUR MONEY! In the description it reads “if you choose to subscribe...” I was never given the option to/not to subscribe in the app and was charged a subscription fee without being notified. Jerks advertised you can listen free. Downloaded app and then the only option is $100 per year subscription. I hate liars. They advertise the APP as a way to listen to a game and then you get charged $100, I deleted it on my phone and tried to cancel the subscription before I got charged and couldnt get it removed. I am now fighting with my bank! I called Apple today and they are going to refund me. $100 for 1 day of using the app, I have never heard of that. App is garbage! Can’t use cause screen kept popping up for Premium. If I wanted the premium tunein I would have paid the $99.99. I do enjoy that I can listen to almost any game that’s on a radio station, but I am very tired of TuneIn cutting to their ads early, dubbing over the broadcast I’m listening to. Sometimes it is atrocious, cutting almost 30 seconds out of a broadcast just so they can rush to their ads. Please correct this, and if it’s hard to time the ads, err on the side of your listener, not your advertisers. We are already paying quite a lot for what is often a free service. You are immediately notified of an autorenewal subscription service via iTunes. After a 7 day free trial. Who wants that? How annoying. $100 dollars a year to listen to the radio seems extreme. stop asking me to review your app! I accept having ads are apart of listening to the radio as it is watching TV, but to play the same ANNOYING ad OVER and OVER borders on torture- takes the pleasure out of listening to the radio. One in particular is the “Allwell” Medicare commercial. Let it be know, I’ll NEVER EVER click, purchase any product or have anything to do with that absolutely detestable ad. The whole sound makes me turn off the volume, it’s like having nails scratch on the blackboard. You even break into music already playing on a station with it and then go back to the middle of the piece that’s playing. This commercial and the Progressive Insurance ads are the worst. I turn off ❌ or down ⤵️↘️the volume when I hear these ads. I tried sending this to you on your (NO)-Help Contact /Tech Support site on your web site, and leaving a comment- so this is for the public to read at the App Store , as there isn’t any other way to contact you. Please PLEASE -Quit playing the “Allwell” commercial every three minutes! At this point- I Willl NEVER EVER buy anything from that company, as I HATE hearing that commercial now so much. I used to LOVE your App - so I’ve gone from a 5 ⭐️ Rating to a (**). Mix your ads up - don’t saturate the market with one horrible one. I now associate that ad with you and that’s not a good association. Automatic $99.00 subscription that you must opt out of before 7 days. Compare to Pandora which lets you install use and then establish a subscription if you like it. Would be nice to have time remaining in the Sleep Timer. You had it long ago and was very useful. This app use to be my favorite app. I listened to my local NPR station all day — everywhere. I own both TuneIn Radio and TuneIn Radio Pro. Early version worked great. Buy each update became clunkier — with unwanted modifications. It began forgetting my sign in — forcing me to continually have to re-enter sign in info. Now it continually stops and begins again at an earlier point replaying minutes of material that I have already listened to. I have become very frustrated. Who would pay for radio? Installed this free app to try and listen to a college football game. It wasn't on the advertised channel so I uninstalled the app. A week later I was charged a $9.99 subscription without warning. Tried contacting support, to no avail. Because it was a subscription charge I don't have a way to dispute it through the app store. Very disappointed. When you download it for first time, they trick you to sign up to there $99 premium membership especially if you have Touch ID enabled..really bad on them...also bad on Apple.com for letting ppl trick and scam ppl using Touch ID If you are not savvy user who knows how to cancel membership, you will be subscribed for one year!!! Good luck! How do I make sure I don’t get billed again for this next text? Why did you bill me for this? I never used it. It was a sample and no one asked me aid I agreed to pay $100 for it. This is a rip off. Will tweet you to make sure it doesn’t happen again. There is no trial. They will hit your apple account immediately. Tried the FREE trial. Decided not to accept the $99 charge Can’t get rid of the app or cancel. Tune In support is not helping. Already sent 2 requests to cancel and 2 emails. Tune In is like a nightmare! It non stop skips and repeats itself. Has been doing this for years. I’m pretty sick of it so just FYI tunein developers, your product is trash. Used to be good like 4 years ago, maybe those developers left to go work for iheart or something. Be very careful with this app. I purchased the premium ver. for $100. I renewed my sub on 9/11 via the Apple store with my VISA. On 9/12 I got a fraud warning from my Bank that TuneIn charged $50 on my MasterCard. I tried contacting TuneIn 1st, but they have no customer service phone...just email. So, I emailed them. After several hours of no reply, I contacted my bank and they placed a stop pay and reissued a new CC card to me. TuneIn finally got back to me and wanted a screen shot of my bank statement (lol, yeah right). I sent them the fraud alert showing the $50 transaction. After about 12 hours, TuneIn got back, via email, saying I’d have to contact Apple with any concerns. My concern was that TuneIn tried charging me twice via 2 different CCs ...and 2 different amounts. As I said...watch your payments with this outfit VERY closely since you can’t call them...and they can’t read! Can't get my station anymore. I got this app to listen to a local sports station when am out I of town. I don't know what happened but I can no longer get this station, even at home. Do I need to upgrade and pay now to get it? I am very disturbed by this, will probably delete the app. Has anyone else had this problem? Used to be my go to app until they decided to violate my first amendment right. Remove Alex Jones & InfoWars channel and you lost a loyal listener for life! Five star losers! Horrible app, they make it impossible to unsubscribe. Why am I getting the sound of a different station and not that of the station I click? No fewer than two online searches for a specific radio station turned up with links on Tunein as being an available station. Links all redirected to download this app, this app drags you into a 7 day free trial before you can even look for a station. Station I wanted wasn’t there. Needs a better “browse” function BEFORE having to sign up for a trial. I absolutely love the tune in app, but as college football season has started, I’ve been extremely disappointed in tune in’s performance. It is extremely choppy, and constantly jumps back into the broadcast as if someone’s hitting rewind on the game. It does this repeatedly over and over again. I know it’s not my Wi-Fi, because I turned my Wi-Fi off, and still had the same problem. I’ve also tried on multiple devices, and I still get the same result. I’ve also tried it on different games, and got the same result. If the developers could fix this problem, that would be awesome. I use this app to listen to all my college football games, so it’s extremely disappointing that it’s performance has become so bad. The app periodically repeats part of the broadcast! Not sure what happens but at some point, it’s like an old-school record player with a scratched record—skip, repeat, skip, repeat. Problem is, I can’t move the needle. Tunein just jumped on the bandwagon of deleting the Alex jones show, also I been noticing a big increase of adds. IT HAS IT ALL! A MUST HAVE APP! An extraordinary range of listening programs! Check it out. I’m pretty mad because I added this app which said “free”, yet I got a bill for 9.99/month, saying I subscribed which I didn’t. They also had my visa number which I didn’t give! Seriously deceptive! I just canceled it immediately (you have a week to cancel apparently) so we’ll see if they still charge me and are deceptive about that too. Delete this. Apparently tune-in decides what we can and cannot listen too. The app is terrible anyway. I can’t even get my local sports stations. Why did tunein censor some of my stations? We did not get any warning and no reason. The stations are just gone. Who gave the order? Who made the decision to censor? How was tunein pressured to begin censorship? What was the consequence for not censoring? Seemingly a victory for corporate fascism but truely a sad day in modern America. Ads are too repetitive and for their own programs. I understand needing ads for free users but tunein seems to pressure users aggressively with the same annoying commercials for their own crap. I just un-installed this left wing fascist app. Stop censoring speech. You may or may not know, but this app is very unreliable. You’ll notice it is very frustrating when you’re trying to listen to a podcast or station. Need a radio app? Keep looking. The TuneIn snowflakes folded like the pussies they are. The ads repeat every few minutes to a point that I have to turn tuneinradio off on a longer rod trip. It is so annoying esp the tunein program ads. Signed up for premium and no difference. Will cancel premium and look for a different app. I enjoyed this app, but I spend too much money for premium on multiple devices, only to have feeds, especially NFL come through so poorly. There is no excuse for feed volume being so low, or sounding like it is being put through a cell phone. Please please fix this! This app used to be wonderful. Then they changed the design so saved stations were stored online. I couldn’t listen to saved stations if the main screen didn’t load from their site. Next they changed the UI. Looks great, but the play button became unreliable. Next update added a play button that stops working until the app is restarted. Now the final straw. They have de-listed several conservative radio stations over 6 months. Infowars was de-listed yesterday. I manually added the link, and TuneIn censored it anyway! I don’t need any app that tells me what I can or cannot listen to. Censorship for political reasons is unacceptable. I will not use a nanny state app that puts style ahead of reliability. Good bye, TuneIn. And good riddance. I’ve found another app. I only use tunein to listen to one show with millions of daily listeners. They removed that show because it does not comport with Tunein’s politics. Eff censorship. Uninstalled! ...without a way to clean up data except to delete and reinstall. It starts off with under 63 MB, but with use, can easily get up to a few hundred. If the developers make it easier to delete data, them my rating will improve. Tune In used to be really good. It seems that every “upgrade” lately has made it bad to worse. I use it to listen to a couple of radio stations. Recently it has started dropping a lot, like multiple times in a single hour. It doesn’t automatically reconnect, either. It shows as buffering at 0% until I finally have to stop it and start it again. Since the last “upgrade” it has started stuttering. It replays the same couple of second over and over. They have deleted and purged alex jones! Another anti 1st amendment app and tech company! SHAME ON TUNE IN! DELETE THE APP IF YOU CARE ABOUT FIRST AMENDMENT!!! Tunein radio has banned Infowars so I have deleted the tune in app. Removed Alex Jones? Pathetic sniveling little hipster Marxists. App removed. Removing this app any going with sources that allow me to make my own choices. I like Tune In a lot. Only negative is there is often a lot of skip back. Jumps back 15-30 seconds through out the day. So Tunein has decided to participate the censorship of free speech and has removed all Alex Jones podcasts! How stupid are you developers? You do realize people who don’t like the info DON’T HAVE TO LISTEN... right! GFY cowardly Nazis... app deleted! Censorship at work! This is NOT an open platform. Conservatives beware. Banning this app from my devices. I guess that’s how it works. Shameful the censorship that is going on these days. Agree with AJ or not, censorship like this is bad for everyone. I used to love this app but they have decided to participate in censorship and prohibit free speech. They have become political by removing info wars and other alternative programs so I can no longer support this app. 1776! Tunein Radio has violated the First Amendment rights of Alex Jones and Infowars. The mass-banning of ANYONE across multiple platforms is RACKETEERING and Tunein, along with all the other Orwellian social media leftist tech giants have declared WAR on Americans and will be EXPOSED AND DESTROYED. DO NOT SUPPORT THE MURDER OF THE FIRST AMENDMENT, DO NOT DOWNLOAD THIS APP!! If you WANT to support the 1A, download the Official Infowars app and give a giant F-U to the ones who want to deceive you and make you a mental slave to globalism!! Hope they lose a lot of traffic and subscribers for being against basic human rights. Can NOT in good conscience support this app anymore. HAVE NICE LIVES! Deleted this app because you removed Infowars. Only reason I used it. Like how I can listen to different radio stations. Terrible app! Removed Infowars from my saved favorite channels in a coordinated display of Racketeering! I want my money back from this app, and can't wait to get in on a class action against this blatant censorship!! If tune-in doesn’t broadcast Alex Jones, I have no use for them whatsoever. Love streaming online, also have it set up in my vehicle for HD2 radio 105.1 I’ve been spreading the word about this great station. It would be great if Ksurf was on regular fm radio for those who don’t have access to HD2 radio in their vehicles. Anti freedom of speech communists. All of you dhould delete this app asap these dirty commies took alex jones podcast off and you cant even search for the show on radio stations, just shows glenn beck. This is an attack on freedom of speech they must pay! 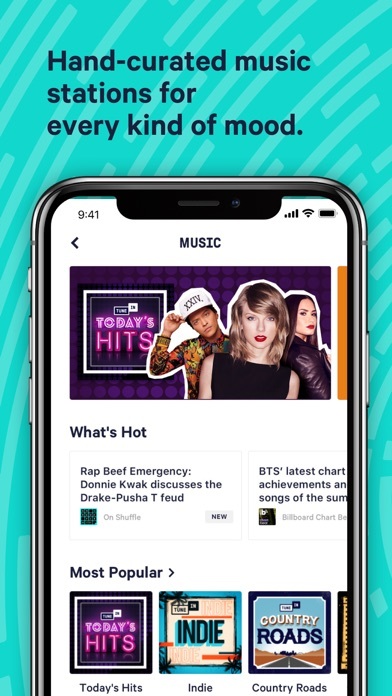 While I mainly use this app to listen to radio stations across the country, I have found that there is additionally a wealth of streaming music stations and other content waiting to be discovered. It truly epitomizes the future of listening. These idiots just removed the Alex Jones show. Who is next? I used to love this app but now I will no longer have it in my phone n will pass this on to all get ride of this app. If ifowars is gone so am I. And I will not be back until u bring it back. I been praising this app for years now I’m the fool for doing so good bye!!!! App is broke want refund. I keep getting an error message saying something is wrong with the stream!! Trash app!! Don’t believe in free speech!! What a disaster companies like yours are. Picking and choosing the ideas you “need” to protect me from. Free speech!!! Way...way...WAY too many ads. More than I’ve heard on the radio or watched on TV. That alone forces me to get rid of this app and move to a competitor. No more Mike Francesa for the NY afternoon drive? No problem. I’m deleting your app. Worthless. I love tunein but, What ever happened to my SEE ALL button? Please bring it back!!! You are still the best radio App out there! I appreciate your station and the service you provide. All my favorite programs and music stations are quickly available to me and the sound quality is excellent. Thank you for being here for all of us that have a variety of listening demands ! Used To be the best, now one of the many. This app went from being one of the best to being one of the many. Ever since the last change in interface everything went the wrong way. Screens stays on all the time. Some stations are imposible to listen to because songs get interrupted with ads 4. 6 or more times during the length of one song. The only reason why I give it 3 stars is because it has stations from all over the planet. Other than that. This app is all about the money now. WOndefull app to stay connected to the wols and to your countries Fav Radio Stations. I just realized I was being charged for this $99 a year. I didn't even have the app installed. I don’t remember ever using it. Bull**** that major stations such as THE SCORE (Chicago Sports Radio) and WBBM (another major Chicago station) are no longer available on Tunein. If they are maybe requiring people to go thru their own network Apps now, then what is the point of your Tunein app anymore ? 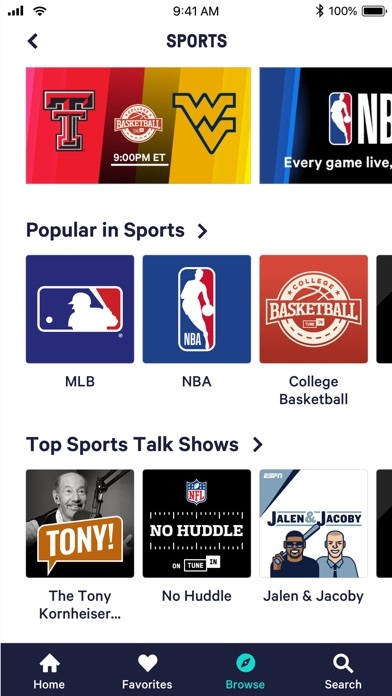 Also, has always been bull that broadcast sports games are unavailable over Mobile device, but can be heard using the same services (Tunein, etc.) on Computer. Me encanta que aunque esté lejos de mi hogar puedo seguir mi estación favorita Gracias!!!!! This app sounds better than some of the individual apps offered by the radio stations themselves. It also works well with Sonos. This used to be my number one go to music player app. Out of the blue, (no updates, no downloads, no nothing), whenever I launch a station now, the app crashes. Go figure. Goodbye TuneIn radio. Hello Pandora. UPDATE JUNE 2018: Still using v11 on my phone. V14 doesn't let you see the remaining time on the sleep timer like v11 does. Please bring that feature back. UPDATE AUGUST 2018: I'm bumping my rating back to 3 stars but still desire the countdown timer to show time remaining when sleep timer is set. V11 is still on my iPhone and still shows that. Come on coders, it can't be that hard to fix. We don't need to see the Zzzz's. I was hoping this would be a replacement for SiriusXM. The cost is definitely better but the options definitely aren’t. There is a lack of sports coverage for NASCAR, NHL, and other events. There also problems with regional commercial interruptions when it comes to major league baseball games. Will more than likely switch back to SiriusXM when my subscription is over. Two problems: 1) the 30 second ad is over so the stream starts and another 30 second ad starts before the stream 2) it does not automatically resume after a call despite the fact that the option for this is on. Also does not auto resume when starting the app. What the . . . What the . . . What the. . .
Why do I get short loops of the same segment of whatever pgm I’m listening to? My signal is fine. I get maybe 7 seconds of a commentary, then mid-word, the same 7 sec, and again and again. Then a 2-min string of ads, then another loop of the commentary. It can take up to 1 hr 10 min to hear a 30-min pgm. Boo. Tune-In is easy to navigate keeps me in tune with my favorite radio stations on the West Coast. Tune in is awesome! Download it! I just love ❤️👌🏾 it 😍. I dont mind having ads that play in between songs but lately the ads have been in the middle of a song and lasts for 3-4 minutes. Not sure if its a push to get you to buy the no ads version but thats a little extreme. The only time I use this is to listen to the morning news. Now ads play instead of the news. Bye bye. I subscribe to Tune In to listen to baseball games. Tune In has recently, a few times a game, run ads between innings that cut into the next inning, often cutting out 2 at bats. This is extremely frustrating, and I am looking to find a different radio app. The app is terrible. Very little selection and the sound quality is horrible. Their are much better apps out there. When you try to cancel is when you find out what they are really about. You can not cancel from the app. You have to go to the web. And when you go to the web they tell you to “contact customer support”. Then you get there run around. You just can’t cancel by clicking a button. Then they ignore you until you are charged again. BEWARE OF THIS COMPANY. They will do everything they can to make cancelling difficult. ZERO STARS. Only radio app you’ll ever need. Very good reception here in Medellin Colombia . I am very glad to receive info about the island . Keep it up ! The app is terrible. Very little selection and the sound quality is horrible. Their are much better apps out there. When you try to cancel is when you find out what a bunch of thieves they are. You can not cancel from the app. You have to go to the web. And when you go to the web they tell you to “contact customer support”. You. Any just cancel. Then they ignore you until you are charged again. BEWARE OF THIS COMPANY. THEY ARE CROOKS. ZERO STARS. I purchased the upgrade for no ads but I still get ads. 7 ads between segments! The first 4 days it worked but then the ads started. Great way to listen to news but do not pay monthly fee you still get ads! Plenty of options for different types of music. Tune-in plays commercials during the streaming of NFL football games. The commercials go longer then the actual allotted time for commercial breaks. So you miss at least three plays. I don't find this acceptable. It makes the game really hard to follow and listen to. When you download the app it enrolls you to a 9.99 subscription. This type of tactic should be removed from all App Store apps. We used to use this app all the time, but recently the stations I saved are no longer working or are no longer available. Also, when I search for any other stations it says they are unavailable also. Sad to do it, but it must be deleted. Love being able to keep up with all my progressive news and commentators. I love this app! This is better than Pandora! It’s the only way to listen to my local radio stations while I’m traveling. However, if there were other options I would use them instead. Some of the programs I’m listening to are so quiet I have to have the volume maxed out only to injure my ears when the advertisements start. This is not a problem when I listen to these stations on my radio. Other times it gives me the ad that usually plays when you start the station on repeat instead of the station. If you aren’t careful with an unlocked screen, you can tap sketchy banner ads asking for all your personal information. They allow obvious scams to advertise on them like “tap now for a free iPhone! !” This app has a lot of potential, but these issues need to be fixed. The Best for new junkies! Used to try streaming MSNBC and CNN on Hulu live but always was buffering and I hate commercials. This app is awesome, no commercials and it streams perfectly on a cell phone connection without WiFi. A must have app for keeping up with live news. *To those reviews about subscription or trial period.. you DON'T need to sign up for the Premium service, nor do you need to sign up for Trial period (which does roll into a Premium paid service if you don't cancel, so just DON'T sign up for Trial period, you can just skip past anything regarding signing up). You can listen for FREE, without having to signup for anything. Too bad that CBS pulled all their CBS Sports and CBS Local News stations off from Tunein (but that is not Tunein's fault). And other censorship concerns would only apply if this were a government run service, which it is not. Those commentators have the right to free speech (with their own broadcast antenna, their own newspaper, their own website, etc) for their views, but other companies such as this can not be compelled to distribute such speech if they choose not to carry it. ---orig--- **Everyone needs to complain directly to CBS Radio (and their Entercom owner)... So evidently CBS Radio (and Entercom, who merged with them) is who forced all of their stations off of Tunein as of July/August, requiring you to use their own radio app instead (which is highly inferior to Tunein). Also, that CBS/Entercom app is not supported by Roku and other services (the way Tunein app was used by Roku). First CBS forces you onto their own subscription service for streaming TV, now they do the same thing for radio. Sad !! Tried for a day. It went to auto renewal, with no instructions to discontinue! Used to like this app, but I guess they are getting political and have decided to censor what they don't think you should listen too. It doesn't matter what side of the aisle you are on, this is wrong. Why is this app $10 and they serve ads? 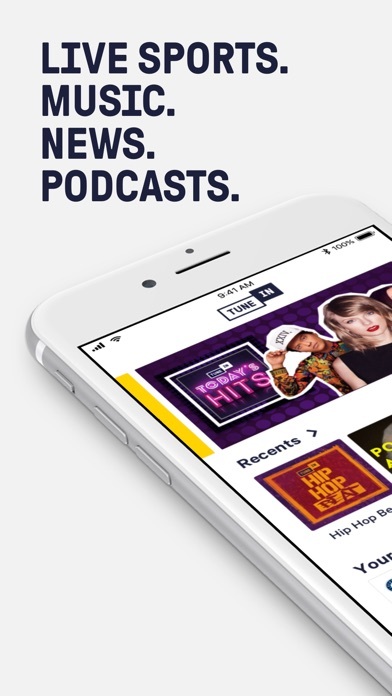 I tried this app out, and they serve ads for the first minute that you are trying to listen to the radio. Why am I paying for this again? I paid for this app to listen to baseball games. They definitely take advantage of the delay to insert extra ads, repetitive ads for their programming. I literally listened to 10 minutes of ads in between innings. I would understand this if it were free, but I paid for it. Minimize the ads and the delay this is a five star app, until then it is really annoying and a bad value for the money. Reading the agreement; it sounds as if you have the option to subscribe. However once you load the app you find you MUST subscribe to listen. I’m only looking for an option to listen to our local radio station when out of the area. Fire the programmers and Managers. The progress timeline bar useless. Jumps by 6 minutes. After 20 minutes is full and rrrrealy useless. Wont show in lock screen. Neither the stop button. The recording menu hidden, doesnt show any recording info. You dont know your in a recording or the RStation. If you lose radio signal drops the whole buffer. Etc, etc, etc, etc. Looking for another app that works. I use this to listen to news channels! I don’t know if others stations are doing it too but MSNBC skips back a few seconds every couple of minutes. Super frustrating! ***UPDATE*** the skipping has gotten worse! Every few min the show jumps back a few seconds. Sometime the same section skips multiple times. You have lost all of my favorite stations. Where is KROQ LOS ANGELES, where is LIVE 105 San Francisco? Wouldn’t let me listen to a thing until I signed up for a 7 day trial that auto-renews for $9.99 a month. So much for advertised as free! Delete! I subscribed to SIRIUSXM for years before finding tunein. Even with ads it better that anything out there. Terrible. I want out. How do I cancel? I really liked tunein for listening to my sports teams but they decided that I was incapable of choosing for myself. Tunein decided they need to choose for me. No thanks. If you are anti freedom, then I am not paying you. Me encanta la app y la mega recomiendo. Es la única forma en que puedo escuchar a mi adorada Carmen Aristegui y su equipo de colegas. Ya cuando ella acaba navego y puedo escuchar periodistas de todo el mundo. No falla la app. This station is the best. Have been a big fan of it since day one. Don’t have an “ on air “ station like it in KC, do it is greatly appreciated ! I would have given it five stars, but a lot of the times I have to listen to five minutes of commercials when first starting the app up. I love to listen to Progressive talk radio and I found it on here, so now I can listen to it any where . I don't like the newest update. I think it looks too crowded. I thought it was fine before. The looping is making me crazy. Some days I can't stand to listen to it which is too bad because it's basically the only way I can get radio. But if it's this or complete silence, I will take silence. Update: looping is still a problem. I used to like this app, right up until they thought they could think for me. I’m not for censorship and you thinking you can decide whom I listen too . You have crossed a line. And in doing so have alienated many people. Bugger off. Many other apps do what this app does, and they do it better and without a political slant. What’s up with your censorship? I’ve used TuneIn for years even after newer services like iHeartRadio came about. Why because you didn’t discriminate. 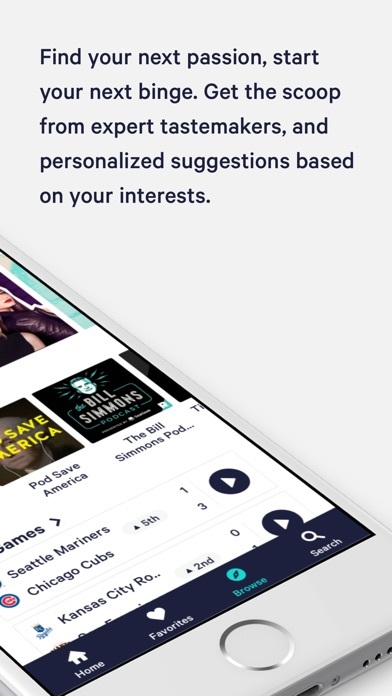 Now you will be the LAST app I’d use for listening to my favorite personalities. When you choose to discriminate I’ll choose to not use your service. Which has fallen off as being any good. It freezes, stops all together, and just closes for no reason. Tune in stole my money charging me for a subscription I never asked for or knowingly agreed to. No spin - No agenda reporting-just the facts. NPR is a great news source for me because NPR cuts straight to the facts and doesn’t interpret the news for me. I just want the facts and I can think for myself. NPR keep a clear view of the world. Thanks! I purchased the premium version of this app in order to enjoy my favorite baseball, football and college basketball teams. The interface was easy to use and I really enjoy the convenience. Too good to be true!?! One of the best values in entertainment. Audio streams of news, podcasts and sports. I love it! There’s an ad free option also that’s totally worth it. Thanks TuneIn! BEWARE THIEF ALERT! I’ve had this app for years and then all of a sudden they started charging me a “premium” subscription for $9.99 a month… UNAUTHORIZED. I understand mistakes can happen, but this is the first time I’ve ever had an unauthorized apple charge on my Credit card. Apple was good about reversing the charges, but if I were you I wouldn’t download this app if you aren’t the kind of person that is constantly on top of their finances. Luckily I nabbed it in the bud, or I could’ve been on the hook for quite a bit. Personally I think these guys are making a money play. Writing reviews for me is rare. So, praise for this app is after a couple of years of use. The trade off of tune-in ads to radio time is low in my opinion, depending on sought network. This also depends on isp data plan. The app functions well (fully) w no noticeable interruptions to explicitly upgrade to paid version. As a radio app it is great for stations far away. Local stations are well served too, but an option to use FM tuner on chip through app w out internet connectivity during emergency situations would be a good idea (unfortunately Apple does not believe in serving users this functionality as of yet). With the return of the 30 buttons this is the best radio app hands down! I’ve always been able to listen to MLB on my PC at work but now, I no longer can. I am able to listen to the NFL as well as others. Is MLB no longer available on PC’s? Since I got Alexa I had enjoyed using it. Now, it is is paperweight because TuneIn radio deleted all my podcasts. Redacted Tonight gone. Common Censored gone. Jimmy Dore Comedy gone. “That podcast is unavailable.” TuneIn I’m tuning out. Please confirm my on line, trial subscription has been cancelled. Thanks! Love it! Use it everyday to listen to rick and bubba! Makes long commutes bearable. Few ads and requires little data. False advertising!! Not monthly subscription !! The app and service is awful!! I was billed in one payment and told I could cancel at anytime because it says monthly subscription. NOT TRUE!!! I have emails from Tunein and Apple saying you are right! But they do nothing to refund future payments. Amex was nice enough to issue a credit for future months but It’s not right. Buyer beware! **Everyone needs to complain directly to CBS Radio (and their Entercom owner)... So evidently CBS Radio (and Entercom, who merged with them) is who forced all of their stations off of Tunein as of July/August, requiring you to use their own radio app instead (which is highly inferior to Tunein). Also, that CBS/Entercom app is not supported by Roku and other services (the way Tunein app was used by Roku). First CBS forces you onto their own subscription service for streaming TV, now they do the same thing for radio. Sad !! This station rocks next best thing to being there boy do I miss the Northwoods but this is great!!!! I’ll listen to Alex Jones whether you want me to or not! I find it kind if funny that you ban Alex Jones for supposed offensive content, but leave up most rap music. Songs that call for killing people, doing drugs and beating women. Kind of sounds like Offensive Content to me, when can We expect you to remove it??? I have tunein on all day long tuned to MSNBC. A couple of times a day it just stops and refuses to find the signal. When it buffers, it buffers OK, but sometimes it just dies. I either have to completely get out of the app and start over or I can tune to another station and then go back to MSNBC and that triggers it to play. It is very frustrating. I have the most recent update. This happens sometimes when I’m sitting completely still. This does not happen with other apps I listen to such as NPR. Why are you banning my favorite show? Tech fascists will not silence Americans, bank on losing! Nothing they claimed actually was delivered, not even the easy cancellation. I used to love this app, but this week in an Orwellian and quite creepy collusion with other platforms, they “unpersoned”, completely erased, Alex Jones without notice of any violations of this platform whatsoever, and curiously, right before American elections. Is this USA, or Venezuela, or Stalinist Russia? No matter what you think of “the person” specifically, it is repugnant to everything it means to be an American, and the other platforms are already subverting the message of many others, banning touching campaign videos for example, from Cambodia-American Elizabeth Heng. This is pretty disgusting and not about a single person, so don’t be diverted with that spoon-fed distraction from the principle. Yeah, they’re “private”, people will argue, while they sell your info to others and argue themselves as “the” platforms for American public discourse, to win that market share deceptively. When opposing viewpoints scare you, your motives are questionable, if not criminal. Let ostensibly “free” people decide what they want to hear. We don’t need “big brother’. Not in this exceptional country. This is Shameful on an Epic scale. Removed all my Sports radio stations that I listened to for years. No more Tune In. Why can I NOT get my 2 favorite stations? A Sports station I have listened to for years & a talk radio station??? Thought this had a free trial and I canceled the subscription the same day I downloaded the app and it still charged me... so no free trial? Getting tired of the bugs. Especially when you pause a show for 10-15 min. And it updates automatically and you can’t go back to see what you missed. Love Tune In Radio for streaming my favorite station WPCC Large Time anywhere I go. I mean this app, seriously. No longer carries 790 The Ticket out of Miami. That means I can’t listen to The Dan Le Batard Show with Stugotz anymore. That was literally the only thing I used the app for. All I wanted to do was listen to the Cubs game with out using my radio. It never worked. I live in Chicago why can’t I listen for free to the Cubs game? I can hear the game on my radio for free but sometimes I am away from the radio but still in the Chicago area. Fuc**** stupid! I enjoy this app and the radio stations I listen to on the app. Interesting that there is no phone number to call anyone and when you email customer service they tell you everything is canceled but you keep receiving charges. I’m going to go for the fourth try to cancel. Companies that do this give subscription services a bad name! I can really listen to all my favorite stations Fromm all across America. When it comes to canceling you subscription there is no clear way of how to do it on your iPhone and they are not helpful at all. Tried contacting customer services and they didn’t help. If you like paying $99/yr for non-stop commercials while trying to listen to your favorite sports team, this app is for you. $99? Never used it and did not sign up for it. Why did you bill me for this? I never used it. Please do not make it so that I have to opt-in to the subscription when I first use the app. It is a pain that you make it so that users must discover how to unsubscribe. It would be appreciated if the first week trail did not automatically sign you up for the subscription. Greatest app ever invented can listen to my local radio stations anywhere I get good cell phone or Wi-Fi reception highly recommend. Tune In radio provides real radio with real news all the time. I downloaded this and had to agree to a free trial which was described simply as going into your settings to cancel. NO. After digging online, emailing (no response), searching the iTunes and the App Store on my phone, I got on my laptop, found a way to access the App Store through a PC, and cancelled the subscription. Good grief. It didn’t even do what I downloaded it for. Pick something else. I paid, but app on my iPad won’t allow access. No support. Created a Tunein account online. Spent $100 for one year of Tunein. Downloaded the app only to find out that there's NO WAY to sign into that account via the iOS app. $100 down the toilet. Thanks Tunein. So easy to use and gets stations everywhere! Look I just wanted to listen to a few minor league baseball games. I didn’t fully understand how this app worked within the MILB first pitch app. I was just autobilled $100!!! This is absolutely unacceptable. There should be mandatory reconfirmations required for such large bills. I want a refund. I have no desire to ever use this app again. You decided to no longer carry the nations first radio station, KDKA, so now it's .... so long, good bye, deleted. Because you guys took 92.3 the fan Cleveland off. That was my favorite station to listen to. I hope that you can please put it back on tunein because a lot of people are really mad that you guys took that station off. Love the station but fades in and out. The app seems to only work as a remote control for the iwatch 3 with cellular. If I go to the gym, I don't want to take my watch and phone.... That's why I paid for the cellular version. Please fix ASAP! The app has been down since yesterday. What’s going on? Ihave an iPhone7. I could never get any radio stations to load. Also when I tried to listen to the World Cup it was impossible. Did not work. This is the first five star rating that I have given in a rather long while. For the free version, this does what I require and then some, it's a great app. I am a visually impaired IOS user and support for voiceover seems to be full. This app is one of the fair few that I can still use. Keep up the amazing work guys, Thank you. I downloaded the app to listen to a game. Completed the free trail. Listened to the game. Canceled trial. Got charged 9.99 for the month. I am annoyed. I used Tune-In to listen to various fire-rescue scanner feeds. Stations are still in the tune-in list but will no longer connect since about a month or two ago. Add them back and I would rate it at 5 stars. Still repeating segments over and over like a skipping album. Love hate this app. Main annoyance is that every 20 minutes (roughly), for no reason, the app will back up whatever stream you happen to be listening to by about a minute. Extremely annoying - and why I won’t upgrade to the paid version. As for ads, I’m in Canada and constantly see ads that should have been geotargeted ONLY to the U.S. Was just served an anti Nancy Pelosi ad. Also see ads for Chase Bank and it does not operate in Canada!!! They’re robbing some advertisers blind with off-target ads. The best stations are here any time ! After the last update, the application started freezing up. Once I close the application and try to open it again later, the main screen will not upload and I have to turn off and restart my phone again for it to unfreeze. This app goes in and out of connecting and doesn’t seem to stream if multiple apps are open. The constant interruptions with “you may have missed” are not helpful and break into the program you’ve selected to listen to. For some inexplicable reason when I listen to public radio, there’s a repeat of questions, stories intros, clips, Don’t think is about public radio but it’s incredibly annoying. It happens when I’m using a headset. Any ideas? Happen to others? Signed up for free 30 day trial. Never used it. Found it impossible to cancel. They changed my card for the year now I’m stuck having paid for an app that I never use. I had long drives for work this summer and this app saved me, I was always able to find a World Cup station and tune in. When I had trouble unsubscribing, the customer service was very prompt and helpful. Great app. The information delivered from this station is unbiased. Continuously bringing information that is interesting and informative. Their news is encompassing of national and international news. I love all their programs. Total crap. Want a refund. No access to customer service. Don't believe positive feedback. Update... wish I could give zero stars. Sucked me in to Premium with audiobooks, which they dropped 2 months later. Now, consistently I get an error message. Had the free app for quite some time which always worked well. Decided to go ahead and buy the Premium service. Since then it works about one day in every four. Written them emails asking for help resolving the issue and no reply. Save your money and don't buy the premium service. Very frustrating. WIBQ on Tune in Radio. Wonderful source of radio that I cannot receive on any local radio. Streaming of great radio with reliable reception and clarity is wonderful. The many sources offer a multitude of interests to the public. I just sent customer support an email and need your prompt attention. I only had this app downloaded for 2 minutes to find a local station. When I didn’t find it, I deleted the app, not realizing that I was signed up for an account with an automatic deduction of $106 from my account. I do not use this app or want this subscription and PLEASE need a refund and someone to contact me immediately as I am in the midst of a nervous breakdown over this lost money. I absolutely will delete this negative review once I am contacted, but don’t know how else to make sure I have your attention. Thank you. Listening to tune-in radio takes me back in time. As well as keeping me up to date with what is relevant now. Used to be great, but with every upgrade it gets worse (not unlike iOS, which may be the problem). Constant skips, repeats, and drops. I can’t recommend it. Does anyone know how I can cancel my Tune In subscription? I never ordered this app and never will. To support a group of overpaid spoiled athletes and to support a treasonous group of anti Americans is despicable. I hate the NFL and it’s overpaid players - I urge all to join me and boycott the NFL - oh yes and I formally request that Apple cancel this subscription, refund to me all monies I’ve been charged and see to it that nobody else gets charged for something that was not specifically ordered. Sadly, this app has gotten buggier and buggier. For a long time, I’ve been unable to delete “dead” stations that clutter my car mode favorites list. Now, car mode doesn’t work at all. Can’t get it to play or change stations. Since I use this primarily in the car, the app is close to useless these days. I’m losing patience since it’s been getting worse and worse for months. Looking for alternatives. Too bad. I used to really like and recommend this app. Now it’s just awful. Previous review: Got rid of all the others. This one does it all. I love the Car mode. I don't even use my XM subscription any more. I listen to my favorite home stations wherever I am. 14.3 amazing improvements at last. Apple play working well. More intelligent trending list. I keep coming back tune in. I use this to listen to news channels! I don’t know if others stations are doing it too but MSNBC skips back a few seconds every couple of minutes. Super frustrating! Lately some of the ads for games will actually start up the App Store so that you can download the game. I understand the need for ads, but I don’t think one app should be allowed to start up another app without permission. (I didn’t tap the ad to open the App Store. Wasn’t even holding the phone at the time.) Quite frankly, I think it’s obnoxious and makes me never want to download the game. If this isn’t part of TuneIn’s software, they need to do a better job of vetting their advertisers and the ads they allow to run on their platform. I like this but when you want to listen to something when you click on it you have to listen to an add. I do not like adds. I really like this app because you can bring it with you and listen to it and you can listen to the Reds game wherever you go. It is good but the adds. I would say getting this because it is awesome. I never signed up for anything but somehow they charged me for a free app. Now trying to cancel I can not figure out how to do it. They say I signed up using an email address. Well I only have 1 email address and that email isn’t in there filing system. A complete joke for a free app. This is totally bogus radio. I’ve never seen an app wanting a credit card number before the app even gets a tryout. Totally ridiculous, and totally deleted. Downloaded this app and decided I did not enjoy it. I deleted the app and 30 days later I got a $100 pending charge on my card. The charge was for “renewing subscription” which I never did. I never authorized this. I would not be trippin if it was a simple $10 charge but $100 for a crappy app is not worth it. I am trying to find a way to cancel this pending transaction, but be careful since this app is trying to be slick! This was a waste of time, I downloaded it to listen to the world cup and it showed like it was playing but you couldn’t hear anything. Volume up all the way, no head phones not connected to any Bluetooth. Didn’t work. Picked up to listen to World Cup. They’re streaming the channel that doesn’t have it on. So no sound. Hilariously inept. Terrible app. Always looping and talk radio will start repeating itself. Always has difficulty during bluetooth operation. I love the app. Lots of variety of programming. Also, much easier to use than it used to be. I have been using Chuning in for almost a year and am still amazed at the variety of programming that I can use. I absolutely love it. Sometimes, however I am frustrated by the wait time before it starts. But overall, it's great. I like this app. It has a lot of music choices. My bad for not reading/understanding the fine print, but got charged $108 after downloading the “free” app. Refused to refund me, sent really condescending explanations about how the service is “free to everyone.” Except for when they surreptitiously & automatically upgrade you to premium. For 108 dollars. I have used this app for several years, but it is totally useless on my brand new iPad and since I upgraded IOS, it doesn’t work on my iPhone either. Are you kidding me? Requests for technical assistance have gone unanswered. I have reloaded the app but all I get is a message that says “We’re sorry. An error occurred with this stream. Please try again later.” I get this on EVERY STREAM EVERY TIME! Great app!!! World Wide Coverage! Military personnel check it out. It says hey it free, but it free like gonorrhea . The sneaky little money grubbing app builders make it so after the two weeks unless you specifically opt you will be charged 99 bucks. Why Apple let a worthless sack of junk like this app exist I’ll never now. It a scam. The app will not cast to a Sony TV. I’m able to see this tv from my phone but Tunein will not cast the music to the tv. I get TuneIn just great with my old iPhone 4 but can't get it with my new iPhone 6. The alarm will not work. If I set it to come on in the morning, it comes on in about 30 minuets. If I set it to come on in 10 minuets, it come on in about 30 minuets. What’s up do I need to go to another app after about 7 Years with tune in? TuneIn was good at one time. But it went out with the old phone. You need to put TuneIn Radio on the shelf with your old phone. Will not work anymore. The app is getting better! Happy to say now I can set the radio alarm to come on in the morning and it turns on at the scheduled time. I set the clock display and can see the time when I wake up. Only once in the last 3 weeks has an ad pop up and covered the time so I could not see it. It’s getting better thank you for the fix. I love the fact that this app offers me an opportunity to listen to radio stations that I’ve experienced and grown fond of while traveling, and I also like having an option to look up specific genres of music! The only thing I do not like is if the song gets stuck and keeps replaying parts of the song being played 2-4 times before it clears up. Overall, the app is really great! Great app for your listening pleasure. Great way to listen to talk radio. Listen to Tune in daily...love it!! It's incredible the amount of ads. To start listening i usually go over 5-6 minutes of ads. Plus when the radio start 30 seconds to 1 min of ads the app starts its own ads and i go over 2-3 mm in of ads which means i lose a lot of radio content! I tried to TuneIn to the World Cup and the quality was horrible. I immediately deleted this app however, this is one of those crappy apps that bills you after a free trial, which just feels like you’re being scammed. I thought by deleting the app my subscription would be cancelled. This is not the case. I do not recommend! Could be better or maybe not. This radio works great! There seems to be less censorship than with other radio apps. However some old time radio shows are not intelligible. Correct that by adding a graphic equalizer and the app earns the fifth star. Can you help me understand how to cancel this app, but more importantly stop fees from being assessed and recoup the fees that have wrongly been charged to my credit card since I have not used this app in months? Got this app so I could listen to stations from my Apple Watch 3 on my Bluetooth headphones! App on watch controls the app on my phone. Can’t hear anything from watch. What???? Edit Saturday July 14 App has happened to numerous people! Just read recent reviews. Interesting who they choose to reply to? Just found out how to find my subscriptions on my iPhone, and see that I was charged $99.99 for a years membership in December. I hardly ever pay for apps or free trial periods. I haven’t used this app but a few times last year. Was just trying it to here local radio station. Definitely would not pay to listen to local radio. I love this app! It is fantastic to wake up in the morning with the radio of my choice. One suggestion for improvement: when I use this application with earphones, the minimum volume of this application is higher than other sources. Even at lowest level, the volume is too high. This may also have health implications. It would be useful to add a volume/sound regulation as part of the app. Thanks! TuneIn USED to be a great app. But it pretty much gets worse with every update. It is also very shady that they force ads onto non-profit and user-supported streams that they don’t host. The app is a client that has the ability to connect to public shoutcast streams. I’m not using TuneIn resources to listen to those streams and shouldn’t have to pay for the privilege of using the app with ads. I’d be happy for pay a few bucks one time for that privilege but I guess they make more by feeding off the creativity of others. My go to radio app. Much better than Radio.com. Tunein Radio has lots local listening options. No crashes, no freezing. Don’t download this app. Tricks you into downloading it when you have to page some huge fee and than they don’t even have your channel that you need. Just found out how to find my subscriptions on my iPhone, to find out that I was charged $99.99 for a years membership in December. Great being able to listen to radio shows across the country BUT the repeats and dropped signal/coverage is frustrating. Get it together!! Tune in is not live radio. Watching the Yankees at night Tunein is always a 1/2 an inning / 3 players late. I will not renew my subscription. This is fraud. I love this app because it allows me to listen to some stations I can’t get anywhere else but the main station I enjoy is not working. What’s the problem? Much better than a few months ago when you had all those long boring sermons! When I’m on WiFi why does your app fail.I use other apps that may stop but return to the spot it was at Your app repeats or skips whole segments. Seriously Tune in?! I can only hear the live world cup stream from the network being advertised in the home page 🤦🏻‍♂️ how about if I prefer to hear it in a diferent language, I think if I preffer other sport comentators I should be able to choose. And to add to my comment I have the app since it cost me a dollar on an Android phone, anyways I hope this app continious to be the app where you can acces radio stations from all over the globe, thank you. Great app. The only thing it needs is a way to categorize all of your favorites which would make it easier to find them. I really like the Tune In app and would have rated it higher but there are WAY too many ads and interruptions during programming. It’d be one thing if the ads occurred during natural breaks but programs are frequently interrupted with an ad. This seems to have occurred more in the last 6-months. Also, this app WILL DRAIN YOUR BATTERY! I’m not sure why it does this because other audio and podcasting apps don’t do it. Other than that, there’s a good variety of things you can listen to. Downloaded the free app. Two weeks later they charged me a hundred and eight dollar “renewal” fee. ONE HUNDRED EIGHT DOLLARS. Even if I liked the app, which I didn’t, I wouldn’t have paid ONE HUNDRED EIGHT DOLLARS for it. Unethical. I’m sure the app works fine - hut I downloaded this free version and it forced to me to subscribe in order to get started. Took me 15 mins of google searching to find a way to unsubscribe. And deleting the app DID NOT UNSUBSCRIBE ME...argh. If you need to unsubscribe - search for “View, change, or cancel your subscriptions” on Apple.com. Good luck. Why is when listening to this app, it takes me to blank website with a pop up saying that I have a chance to win an iPhone. How is this app able to do that on its own? I can be doing something else and have tunein playing on the side and when I come to check my phone for whatever reason, it is on this website. What’s up with that and protection of privacy? The app should be terrific but the same 2 or 3 ads play OVER and OVER. I paid for premium for a long time but it was barely better. Please fix this and maybe some customers will return. On my iPhone, tunein will periodically keep repeating the same 10 seconds of the broadcast over and over again then jump ahead. Frustrating. I wanted to use the app to listen to life cal news and traffic on my commute. When the station breaks from national program to leave cal information, the app cuts and n with commercials and broadcasts over local information. Bring back the 30 sec buttons! Why were the 30 sec back/ forward removed? I listen at work and often need to back up to hear something I missed. The slider is annoying and not easily controlled. Generally I really liked the app but changing something I use 20 times a day adds a high level of annoyance. New update and still no 30sec buttons. I listen less and less everyday. This app keeps getting less usable. I’ve noticed that this app has been more stable, crashes less and runs just a little bit better. I attribute that to upgrading my phone. Now, that being said… WHERE ARE THE 30 SECOND SKIP BUTTONS?!?! I don't want a scan button. There is only one station that I use this app for. I’m NOT going to search for other stations on this app. Taking away the 30 second buttons made this app worse for me. Trying to use the scrubbing on the timeline doesn't work, but for some reason it works pretty good on the Droid version. :-\ This app is getting to be not useful to me and I’m getting closer to deleting it. Please fix! This app consistently skips around and repeats parts of the radio show you are listening to. Usually good for 5 mins then starts repeating every 30 second clip- makes it unusable. Deleting this app if it isn’t updated soon. Useless app - nothings works in CarMode(used button in app to switch). Deleted. Steps to reproduce: - select car mode - close app - open app - car mode will be loaded-restored - select any radio in Favorites to play - nothing happens in Car Mode now tap on any station do nothing, music not playing. Only way to play is start from other screen. I have upgraded twice in the past week. Since then, all that happens when I try to use the app is an error message and “try again.” Been using the app for years. Very disappointing. I’m using an iPhone with iOS 11.4. Best ever online stream Radio I get.. Some days Tune-In crashes a lot and there are long interruptions (10 seconds or so) while the progress meter spins as the device tries to reed tabling the connection. I am an upgraded member and can no longer listen to what was once a superb app. EVERY talk show begins to repeat the same dialogue and there is no way to stop it. This has been reported by many others but nothing is done by the developers. Don’t bother with this app. I enjoy listening to the older songs. Every radio station I tried to listen too will not work. It would only say error, try again later. Don't use it if you live in California. The app is terrific with the exception of two big faults. The first is that it sometimes loops a small portion of audio and you’ll listen to the same minute of audio over and over until you close the app completely. The other huge issue is the heavy amount of advertising with only a few advertisers with 1-3 versions of their ads. Geico, Mattress Firm, Total Wine over and over and over and over. You can purchase the “ad free” version. But this does not change anything. I don’t understand how you can call yourself a free app when you can’t do anything in the app without giving your credit card information for a “free trial”. Very misleading. Do not recommend. Sin duda alguna Tune In es lo mejor. Siempre que puedo le sintonizo con muy buenos resultados. Me gusta y la califico con 5 estrellas. Éxitos. Great at downloading commercials. The same ones over and over... Actual content, not so much. Years ago this app was my go-to. It was easy and flawless. Along came the ad greed and it’s now horrible. - buffers, blanks, and unreliable. Why are the ad volumes twice as loud as the broadcast? Makes it tough trying to listen at work when an ad comes on and the volume increases two fold. Please equalize the as volumes. nothings works in CarMode(used button in app to switch). in Car Mode tap on any station - do nothing, music not playing. Only way to play is start from other screen. But anyway I can’t switch radio later in Carmode, when selected any station from favorites and tapped on it - nothing happened. I am in the process of trying to get a refund. I did a trial and found this app useless. I thought I cancelled the subscription, but it was not cancelled through the work around that puts the subscription under iTunes subscriptions. I was shocked to find a $100 charge for something I never wanted! So far both iTunes and tunein are washing their hands of this. Again I say, don’t even give these people your information!!!! So disappointed with the latest updates. When opening this app I see “an error occurred, please try again”. Please, fix the bugs associated with the current problem! This problem has been going on so long it has become a “feature” so I’m trying to listen to a show but about every minute or so the audio rewinds about 10 seconds and I have to si through the same audio I just heard ten seconds ago. Sometimes it doesn’t happen for a while but more often than not its between one minute to 30 seconds. I love TuneIn Radio, but for the last month or so, it skips, then goes back and then continues with radio. I’ve cleared my cache and cookies on my iPhone, uninstalled the app, reinstalled it and restarted my phone, and it still happens. Downloaded this "free" app and was suddenly a part of a subscription. After I canceled it, I was still charged. No ability to control how podcast episodes are played (ie. Play only the newest episode of each podcast in my favorites). 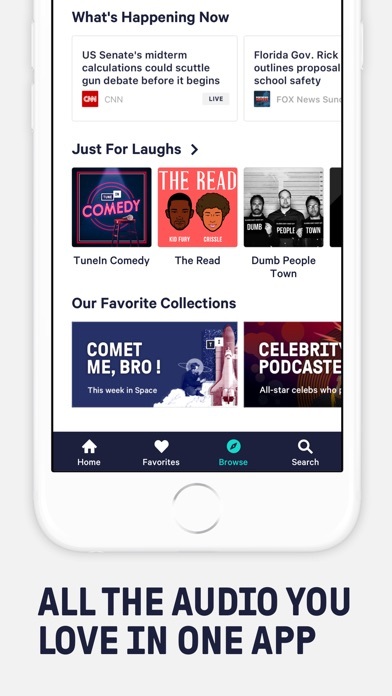 You need to navigate to each podcast and select what you want to play. Also annoying, you can't sort your podcasts. You get nothing for premium, which is why they try to trick you into paying for it. Also, it just doesn’t work. So, if you want to spend $10 and still NOT be able to listen to the World Cup, this is the app for you. What a ripoff. I have been using this app for more years than I can remember and it is still my favorite streaming app. Since it’s conception, many other apps have appeared but none compare to tune-in. My favorite quality is that it has The Best if Art Bell! I guarantee you will not find that anywhere else! You can’t listen to anything without them making you pay for free content you can stream on the web. Don’t waste your time. So I use app to listen to Red Sox games and for a while it was fine. Now when it is between innings instead of the commercials all I get is horrible loud static. WHY IS THIS? It is horrible and if not fixed gonna go another route to hear games. This used to be my number one go to music player app. Out of the blue, (no updates, no downloads, no nothing), whenever I launch a station now, the app crashes. Go figure. Goodbye TuneIn radio. Hello Pandora. UPDATE JUNE 2018: Still using v11 on my phone. V14 doesn't let you see the remaining time on the sleep timer like v11 does. Please bring that feature back. Almost all of the Taiwan radio station streams are not working. Same with radio streams from Mainland China. This has been a common problem with your website and app for years. Why do you have the radio streams listed on your website and app if they never work? I loved this app to begin with, then 4 months into my full year subscription they dropped all the audiobooks. So now I do not use it. I so wish there was a zero rating!!!! Soooooooo frustrating!!!!!!!!!!!! Apparently with the most recent update you cannot preview episodes of podcasts as before. If you choose the podcast as before individual episodes doesn’t populate, the most recent episode begins to play. Otherwise, it’s not even close, by far the most satisfying app I’ve ever used. This app is awful and this is the reason why no one listens to terrestrial radio anymore the stream repeats and loops several times making it impossible to LISTEN to TALK radio when you hear the same sentences looped!!!! AWFUL app I can’t wait until radio stations become extinct like he dinosaur!!! I would never pay for an app that doesn’t work correctly!!! I will be uninstalling and never coming back... ever!!! DO NOT DOWNLOAD THIS APP!!!! I can’t get Knx radio to work. Auto-Play Last Station Upon Application Launch! I’ve been happily using TuneIn for a long time but some recent changes have reduced my happiness. I listen to a morning talk show and sometimes I have to pause it to take a call. The loss of the 30 second skip makes pausing a show almost useless since you can no longer skip commercials easily and dragging the slider bar moves the audio in such huge chunks I miss large parts of the show. Another issue is that I have to turn off WiFi when listening while driving otherwise the show skips back about 30 seconds every time I pass an available WiFi signal. Other than those things I love the app for what it provides. I have used Tune in for years, loving it. But with no notice and no explanation all of f ac sudden I cannot access it. Shame on you. I shall find another way to listen to NPT. Difficult to use and waste of money. Trying to cancel and get a refund. I’m able to listen to my favorite morning shows. Even when I am on the train or jogging. Sadly, this app has gotten buggier and buggier. For a long time, I’ve been unable to delete “dead” stations that clutter my car mode favorites list. Now, car mode doesn’t work at all. Can’t get it to play or change stations. Since I use this primarily in the car, the app is close to useless these days. I’m losing patience since it’s been getting worse and worse for months. Looking for alternatives. Too bad. I used to really like and recommend this app. Previous review: Got rid of all the others. This one does it all. I love the Car mode. I don't even use my XM subscription any more. I listen to my favorite home stations wherever I am. I love that I am able to hear any MLB game that I want. I’m even able to choose which team calls the games. Cancelling my premium service because of this error. Have not been able to use the app for a week. I cannot find anything about this error online. Found this station scrolling thru the music and its awesome music. Playing new and old , been telling people about this station. Keep playing the best of Jon’s Tejano Icehouse Radio Music . Greatest app ever. I listen to every Yankees game no matter where I am. After each update for the last year or so, this app has gotten worse and there are way too many problems when using Apple CarPlay. Most of the time, it doesn’t work on start up and I have to use my phone to force close app then start over. Changing stations doesn’t work correctly either. It either won’t change or crashes. I’ve deleted app and started over or reset phone and started over to no avail. Crappy app! Did not have them, now we do for $10 a month!! What up!! App does not work reliably. Crashes all the time. Accidentally gave poor rating earlier....my mistake. I love tune-in!!!!!! I like the streaming of channels or artists/podcasts but I don’t always get the same results of available stations. I know the program that I want is on but sometimes tunein shows the live station and other times it does not.....only shows the podcasts of previous episodes. Or it shows a live station but when I want to see other channels playing the National show that I want to listen to, the app does not respond to me pushing the “see other live stations” link. My talk shows work fine, but Chicago Police Scanner(s) stopped working. Have used police scanners for years; Am I doing something wrong??? Regardless of where I am, when I listen to a baseball game it will constantly be buffering. It’s annoying. Requests to bring this feature back has fallen on def ears. They would rather have you scan out of the station you like to visit other stations. Similar to an ad bomb. The slide bar does not stop where you need it too. No longer worth the price. Looking for a new app now. Seems to always be delayed by two or three pitches than actual playing time. Your app keep repeating itself, like a broken record. Please fix it. I found a summer time radio station, from Myrtle beach, on here and now can listen all year long!!!! Great app! I Easy to use. I can listen to any station I want. Great app! A lots of variety. I pay $10 for this app for no ads now they playing ads to it not fair! Tune In removed the audiobooks option, under the radar, with no warning. That was literally the ONLY reason I subscribed to this app. Repeated efforts to contact them to have my subscription refunded in a pro-rated manner go unanswered or, when someone did finally respond I was flatly told that they cannot refund my money. This is bad business. I am appalled at the bait and switch tactics. Beware.